I have this one - I really like it. The speed is not ideal though. The looks are imba too, although that is discussable. From a pure aesthetic view, this gun is fantastic and unsurpassed by any other item I have ever seen in the game. For hunters, the bow they receive from their Epic quest is better than this, so this is usually seen as an item for both Rogues and Warriors. This item should go to a rogue or warrior because the http://www.wowhead.com/?item=18713 from the Hunter quest is better and easy to get for hunters. This is a pretty good gun for any class eligible to use it. However, hunters seem to stick to bows in endgame instances. It is pretty slow so a hunter will probably want to pass it on to a rogue or warrior because of the stats. Looks pretty cool though. was a nice gun still is for dorf hunter! "The eye is watching us!" Best firing animation in the entire game, IMHO. Absolutely beautiful. D: Why can't we see stuff like this in LK? Hopefully, they'll implement more unique animations for ranged weapons come Cataclysm. I wonder if this item was removed during 5/3/2011's maintenance/hotfixes. Oh well, at least I still have my Bag of Gold. I wondered if there are any items in the game that shoot actual fire; well if anyone else was wondering, two items that shoot fire are the Goblin Dragon Gun and the Fire Eater's Guide. Just a shame rogues are "enforced" to use thrown weapons, for the purpose of Deadly Thrown. This weapon (with the incoming patch 4.3 and Trasmogrip.) is gonna rock really! Also seems to be a pretty uncommon drop from BWL bosses. I got 2 lately, but belive me, when I say (write?) that in 6 years of wow, I've seen it drop less than 5 times. 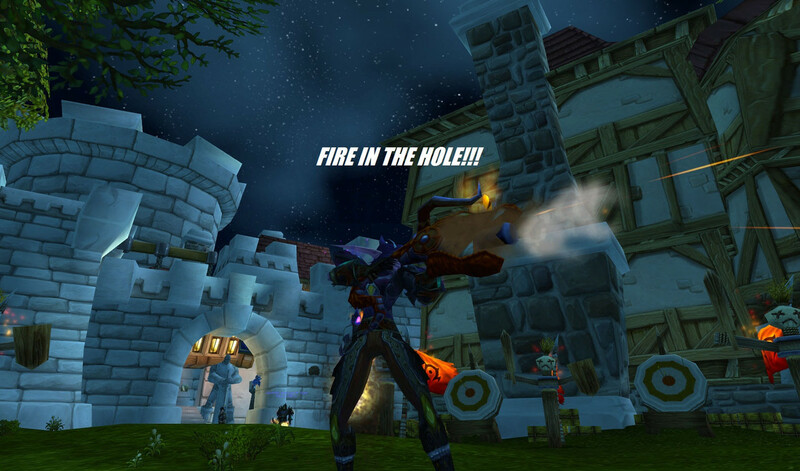 http://s8.postimage.org/d4dxcl5qc/rif.jpg Fire in the hole..! It's listed as a 10% drop rate but there's no way. It drops way less than that. Why have I not seen a hunter transmog this yet! Anyone know if this still drops? Been doing BWL on 2 chars every week for a year and haven't seen it dropping anymore. I wish they'd update the textures on weapons like this. It looks out of place with the higher resolution items released since. I love the firing animation. - Frost Witch's Garb Lookalike (since legs are missing, you can get a good pair of pants from Azgalor in Hyjal Summit raid (Schlaufengenähte Gamaschen). - The Earthshatterer set from old Naxx, obtainable via BMAH. All of those sets use some variants of red and dark orange/brown, matching the gun quite well. Excited! Yes, it finally dropped for me! Out of all things on my rogue. Thank God she has the proficiency for ranged. Appearance collected lol. Here are a couple of screenshots. I guess I will submit them to Wohead eventually. I'll be rocking this gun for awhile. Affter finally getting this gun (about time too) and testing it, i have found oy tthat the unique fire animation for the gun itself only presents itself with auto shots.